Apollo Bay Arts Inc. is hosting its 42nd annual Art Show. Learn to sail, right here in Apollo Bay! Courses for kids, teenagers and adults delivered by experienced and friendly qualified Australian Sailing instructors. CFA Community Fireguard Facilitator Kylie McLaren will conduct the session. Take this opportunity to review your Bushfire plans, update resources and connect with new neighbours. Latest news on the Barham resort proposal, coastal erosion and the harbour redevelopment. Get involved and find out what’s really going on! For further information and to book go to summerbythesea.vic.gov.au. Watch the acclaimed film The Whale Chasers and hear from DELWP Wildlife Officer Ian Westhorpe. This is a free event and is suitable for all ages. Children under 16 years of age must be supervised by an accompanying adult. 10.15pm for approx 10 minutes. Colac Otway Shire Council has prepared the draft Colac Otway Tourism Parking and Traffic Strategy for Apollo Bay, Skenes Creek, Marengo, Wye River, Separation Creek, Lavers Hill, Forrest, and Kennett River. A draft of the Kennett River Tourism Parking and Traffic Strategy has also been prepared as a standalone document for Kennett River. The draft strategies will be on public exhibition from Mon. 7 Jan to Fri. 15 Mar 2019 on the Shire's website. Is it true that I can reduce my power bills if I install solar panels? Batteries, are they worth the cost? Can I take part in the community bulk buy scheme? Am I eligible for the $2,225 Vic Government solar rebate? Whether you are a resident, holiday home owner, business person or member of a local community group, this is a fantastic opportunity as the Federal and State Governments are offering great subsidies and financing for you to make the move to renewable energy! 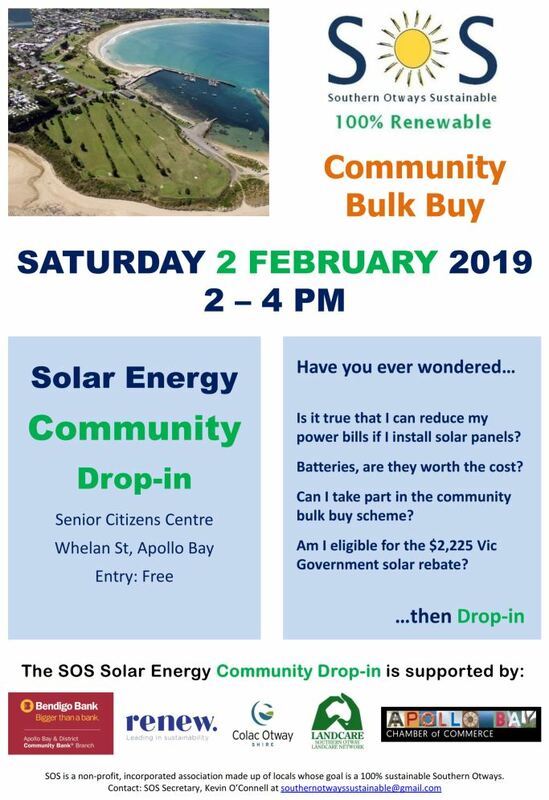 If you have a solar array installed (either here, elsewhere, on-grid, off-grid, now or in the past) it would be great if you could join us at the event to share your experiences with others. We have a table set aside for folks who would like a personal view on what installing solar means (rather than a technical overview or a sales pitch). Any support which you are able to provide between 2-4 would be greatly appreciated even if it's only for a short time. We will also have an info table on the Apollo Bay foreshore on Sat 26 Jan from 9:00 - 12:00. Always looking for folks to help setup and manage these events on the day. You will feel good and the planet will thank you for it! Register as a U3A member to attend courses at no extra cost (exceptions may be for materials or for transport). $20 per person per annum. Bookings for term 1 will open on 12 February, come along and chat to presenters. Afternoon tea will be available. Convened by Sarah Henderson MP. All welcome. Come and join us to see how much rubbish we can collect off of our beautiful beach in ONE hour. The rubbish will be displayed at the Fisheries stand at the Seafood Festival to raise awareness of the impact of plastic in our oceans. Sat 16 Feb, 9am, ‘Mothers Wall’ beach entrance at harbour. Bags provided. BYO gloves if you have them. We are also hoping to raise enough money to buy a Seabin for Apollo Bay harbour, a revolutionary ocean cleaning floating rubbish bin that operates 24/7 catching all floating debris in the water. For donations please go to au.gofundme.com/sea-bin-apollo-bay or visit us at the Victorian Fisheries Authority stand at the Apollo Bay Seafood Festival Harbour Day. Thank you! Famous Oyster Shooters, Gourmet hot dogs; Ice cold beer & drinks. Relax on our dog friendly lawn. Bean bags, plenty of shade, Aussie music. Sausage sizzle and warm up music from 5pm. 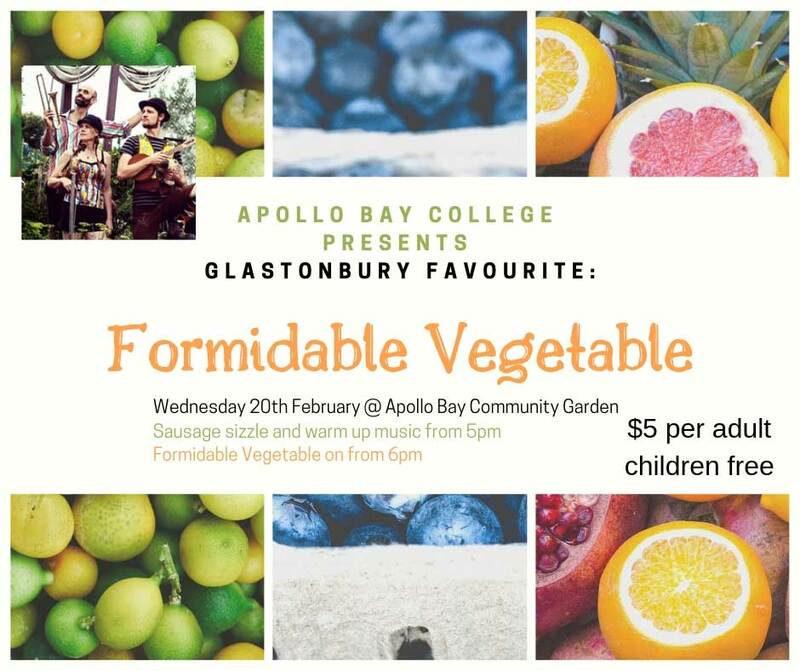 Formidable Vegetable on from 6pm. $5 per adult, children free. Kleopatra VII, the last ruler of the mighty Ptolemaic Empire, is one of the most instantly recognisable figures from antiquity. Her deeds or legends, legacy and identity are debated around the world. The image that predominates is of a beautiful, extravagant seductress, often clad—if clothed—in very little at all, and played by Elizabeth Taylor (or Vivien Leigh). But what did ancient historians and archaeologists know about the “real” Kleopatra? Building on surviving literature, everyday texts preserved on papyrus, sculpture, coinage, and more, we will view Kleopatra as ruler of a vast, still-powerful monarchy and associated bureaucracy, as a powerful woman in a time of nearly unbridled patriarchy, as a survivor in a real-life “game of thrones,” and as a target of vicious Roman propaganda blaming her for the outbreak of war between Augustus and Marc Antony. How was she remembered by a Roman culture that hated and was captivated by her, and by later works - mediaeval Islamic scholars, Renaissance painters, and modern filmmakers? In short: once we strip away the layers of confusion, misogyny, and legend, who really was Kleopatra? Andrew Connor is the Lecturer in Ancient History in the Centre for Ancient Cultures at Monash University. His work focuses on the temples of Roman Egypt - their economic infrastructure, relationship with the Roman state, and eventual collapse in the 3rd century CE. He completed his PhD in Ancient History in the Department of Classics at the University of Cincinnati, and taught at the Cincinnati and Xavier University before heading to Australia. He currently teaches Roman, Classical Greek, and Hellenistic history and archaeology, along with Greek and Latin language, at the 1st year through Honours levels. He publishes editions of documentary texts preserved on papyri on topics from the Ptolemaic, Roman, and Byzantine periods in Egypt. He lives in Elwood, and in his free time is a member of the Port Melbourne Football Club. The meeting opens at 6.30pm to allow you to place your food order and be seated for Andrew to commence at 7pm. The Hotel offers a fixed price menu of $20 but you may order from the regular menu. Pink bowls are on each table for donations. Donations are optional but all received are distributed back into the local community. See here for further details about the Discussion Group meetings. Matty Orchard's band, The Rank Outsiders, is launching their new album. It's coming out on CD and a special limited edition vinyl. The Rank Outsiders' and Georgia's releases were both recorded right here in the Apollo Bay P-12 College House Of Rock studios. Our family has been travelling Australia for over a year, and will continue till 2020, spreading a global peace movement we not only believe can heal the world, but we can prove it! This presentation uses the latest scientific research to prove that when large groups of people unite, and create elevated, coherent, heart based emotions, we can intentionally influence the field that sustains all life on the planet. This presentation will empower anyone who feels helpless in the world, and presents evidence that shows we each posses the internal technology to create lasting change. This is a none religious, neutral, measurable scientific solution for peace. Be a part of over 1.5 billion people, consciously uniting to create lasting change on our beautiful planet, and bring universal peace to the whole. The Colac Otway Shire Grants Program 2019-20 provides one-off financial grants to assist in funding projects that benefit the wider community and help in achieving goals and outcomes consistent with Council’s objectives. So much of moment is happening in America’s politics that we must try to make sense of it, and we must do so by understanding the peculiar nature of the Presidency, the Congress, and the parties. First – a President has enormous power, and it is hard to put his neck in a noose, but it is not impossible; Trump is under enormous and increasing pressure, with several investigations probing his relations with Russia and his American financial dealings, and threatening both ordinary legal action and the extraordinary process of “impeachment”. Second – the Democrats’ electoral victory in the House of Representatives last November not only strengthened investigation of Trump, but now can be seen as epochal: a rare, deep change in demography and ideology. Third – this change is reflected in the remarkable variety of Democrats who already are competing for the party’s choice of a presidential candidate to confront Trump in the 2020 election. Overall, Trump’s contempt for fundamental norms of democracy has stirred people to defend those norms more vehemently than has been true for decades. This is a striking example of the ironies of political history. Ray Nichols was a Wilson and Danforth Scholar at Princeton, and a Rhodes Scholar at Oxford. He taught at the University of California before moving to Monash University, where he was Professor and Head of the Department of Politics. He has written extensively on political ideas and action, has broadcast regularly on the ABC and Radio Singapore, and has led several community action groups. The meeting opens at 6.30pm to allow you to place your food order and be seated for Ray to commence at 7pm. The Hotel offers a fixed price menu of $20 but you may order from the regular menu. Pink bowls are on each table for donations. Donations are optional but all received are distributed back into the local community. A free public event run by Museums Victoria (Melbourne Museum) in partnership with Parks Victoria. The Otways’ moth fauna is truly diverse, with over 1000 species recorded from the region. From the first thorough survey, conducted by George Lyell in 1907 and 1908, to recent surveys carried out as part of Museum Victoria’s 2018/19 Otways Bioscan, the beauty and variety of this group of Lepidoptera never ceases to amaze. As part of the Bioscan partnership between Museums Victoria (Melbourne Museum) and Parks Victoria, we would like to invite you to attend a very special night-time event: Moth Magic. Come and visit the moth-sheet and see first-hand some of the spectacular and bizarre moths that live in the Great Otway National Park. Gain insight into how surveys are conducted and hear about our teams’ moth-spotting travels and their work at the museum. Find out how the work of our dedicated volunteers has led to exciting new discoveries and scientific developments. Please join us for a night of moth-spotting at Sheoak Picnic Area, Garvey Road, Great Otway National Park. When: Saturday March 23rd, 2018; any time between 6.30 pm and 10.30 pm. What to bring: A torch, camera, comfortable shoes, warm clothes, a hat or cap and sunscreen. Please note: In order to attract moths to the sheet, we use a mercury-vapour light. While this light is safe and has built-in UV filters, some UV is still emitted and thus we recommend that participants wear a hat or cap and sunscreen, in order to protect their eyes and face from the bright light. Our first music event for 2019 is a great opportunity to get together with friends. You can book a table of 10 (max) or come on your own and join others. "...not only classical music, but also jazz and other styles that are not usually performed by a classical string group"
Tickets $25 available now ONLINE (click here) or from Galapagos Bookshop and Lyni's in Apollo Bay. Latest news on Wards for COS?, Coastal Erosion and the Harbour Redevelopment. 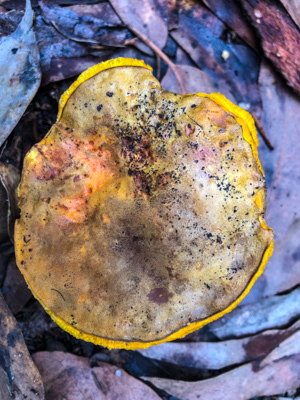 Although fungi underpin the resilience of terrestrial ecosystems, they have been overlooked in Australian biodiversity conservation. With the guidance of ecologist, Alison Pouliot, local Otways communities have been exploring and documenting fungi for over a decade and as a result, fungi are now included in local conservation. In ‘The Allure of Fungi’, Alison explores the possibility for fungi to be recognised as vital to functioning ecosystems and offers the opportunity to think differently not just about fungi, but the natural world more broadly. This illustrated and interactive seminar explores the significance of fungi through a range of voices from naturalists to philosophers and members of the local community. The meeting opens at 6.30pm to allow you to place your food order and be seated for Alison to commence at 7pm. The Hotel offers a fixed price menu of $20 but you may order from the regular menu. Pink bowls are on each table for donations. Donations are optional but all received are distributed back into the local community. This is my favorite time of year for photography. It's so much Fun-guys (sorry!) but Fungi are amazing to photograph. For me in the abstract, even though I know so little about them. That's why I put my hand up to help SOLN (SouthernOtway Landcare) host Allison Pouliot's Fungi Photography workshop on Easter Monday, 22 April. I'd rather find an amazing Fungi than a hidden Easter egg, even a really big one. Fungi make for truly amazing photographs. We will be out in the field with Alison in the second half of the day. So please come along and join the Fun(-gi). Image (left) by David Simmonds was shot on his iPhone and edited slightly in Adobe Lr Classic CC. Book now (see poster image) or message me (David Simmonds) for more info. or to register. See Alison's amazing images here. To hear Alison talk, she knows so much - listen here. Any questions please call David on 0418 328 710. Meet at 23 Ferrier Dve, Marengo. Tea, coffee, bickies supplied. BYO lunch and gumboots. Please contact Judi on (03) 5237 6318 or Pip on 0417 582 407 for further details and so we know how many people to expect. Voting will take place for the 2019-2020 Committee. Nomiations are invited. Formerly known as the Great Ocean Road Marathon, the event has grown to allow runners of all ages and fitness levels to participate in events ranging from the 1.5km Kid’s Gallop all the way up to the 60km Ultra Marathon. In order to make the event an even better weekend away for runners and their support crew, be it family or friends, we’re bringing you even more things to do in Apollo Bay & Lorne than ever before. The spectacular setting of the iconic Great Ocean Road makes the Great Ocean Road Running Festival a must-do for your running checklist. Whether you’re travelling from regional Victoria, interstate or from around the world, this Festival based in Apollo Bay & Lorne is a great destination for a running weekend away. Participants rave about the friendly, local feel of the event, with many coming back year after year. If you’re looking for your next big challenge, this is it. Fundraise for the Apollo Bay & District Health Foundation while you enjoy your run.